Get colorful! Fat Tuesday is a time of wild fun and letting down your hair, so what better time to grab a costume – they aren't just for Halloween, you know! 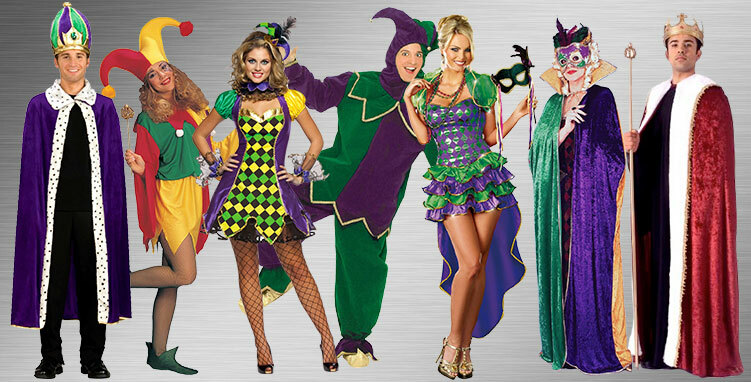 This collection of Mardi Gras Costumes includes capes, vests, masks, full dresses or jester outfits, beads, hats, and lots more, with plenty of greens, purples, and golds to go around! 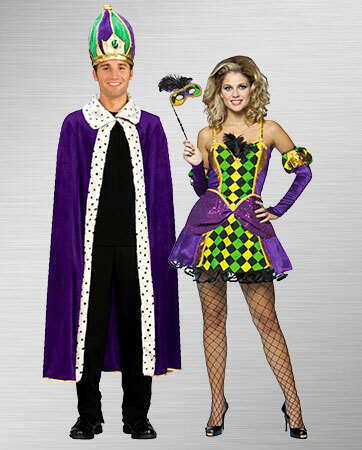 Whether you are a King, Queen or jester, you are sure to have a roaring good time on Fat Tuesday. Royalty and laymen alike engage in the revelry, and possibly even some debauchery, which will last well into the wee hours of the morning. From decadent meals to drinks the size of a bowling ball, this holiday is all about going over the top. Show your creole pride with a crazy costume that will help you blend in whether you are attending a parade, ball or a party with your friends. No matter how far you are from Bourbon Street, you can bring the magic of the French Quarter to you for this wild and wonderful night. Douse yourself in lustrous fabrics, textures and the typical gold, green and purple colors of the holiday. If you love to make people laugh no matter the expense, you may have been born to play the role of the jester. Don’t shy away from playing the fool in this elaborate costume. The emerald green and royal purple pants and tunic are trimmed with gold for the Fat Tuesday trifecta. Complete with golden bells that jingle when you walk, this costume is the perfect Mardi Gras getup. You won’t need to worry about making a fool of yourself, because that is precisely your goal! Live in the lap of luxury with everything you could ever desire, if only just for one night. 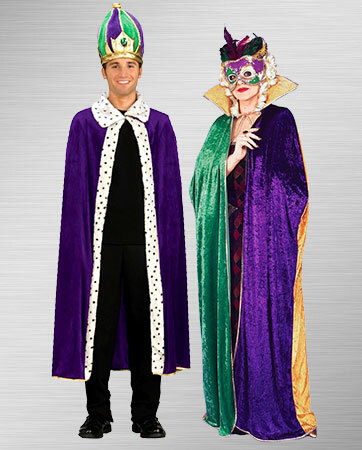 As a Mardi Gras King, you will be the ruler of the roost and the talk of the party. All eyes will be on you and you just may be able to snag yourself a Queen. With an impressive cape and regal crown, there won’t be a shadow of a doubt who the King of the krewe is. Jaws will drop and the big brass band will break out in song when you show up in this seductive and celebratory Mardi Gras getup. From frills to thrills, you will be the life of the party whether you are handing out drinks or dancing to zydeco. The purple, green and gold shine brightly with metallic hints to perfectly accent all the beads you will rack up. With a flowing back skirt panel you will look just as good walking away as you did coming in. No one messes with the queen. The almighty ruler may be the King, but we all know that you’re really the one calling the shots — or at least taking them — before you make your way to the parades down on Bourbon Street. Don some purple for justice, green for faith and gold for power in this playful and provocative mini dress. You will sparkle and shine with sequins, feathers and ruffles that make you feel feminine and festive. A laugh is always better shared. If you live in New Orleans, you know that Mardi Gras is far more than just a day of parades and revelry. Marking the day before Ash Wednesday, Mardi Gras is a carnival celebration beginning near the Christian feasts of the Epiphany. 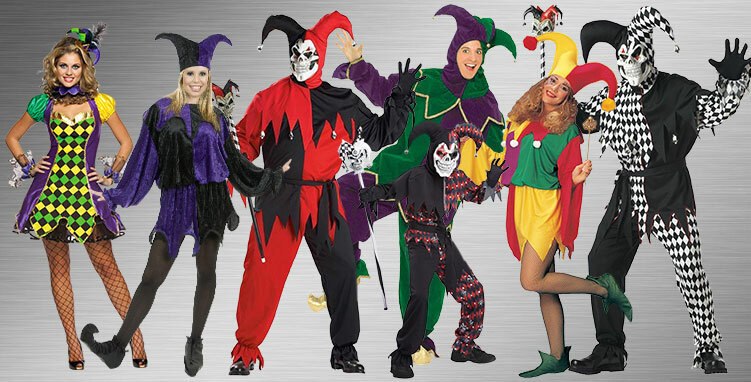 The whole family celebrates the tradition, and with these jester costumes good times will be had by all. From the smallest joker to the biggest fool, there is something to fit everyone. Whether you prefer slapstick humor or a quick wit, you will be able to practice your routine with a troop of funny ones by your side. As a royal couple, you have many duties. But on Mardi Gras you can let go of any expectations of regal behavior and throw caution to the wind. Let loose and have a good time while being endlessly entertained by the court jesters. The libations will flow freely, the food will be decadent and you two will be the center of attention. This will be a Mardi Gras party you will never forget, so practice your grand entrance for all to admire. You will have the crowd in stitches by the time you two are done with them. Your quick wit and tomfoolery will keep partygoers on the edges of their seats. Forget tacky party games and awkward small talk, you will get guests laughing uproariously and having a genuinely good time. 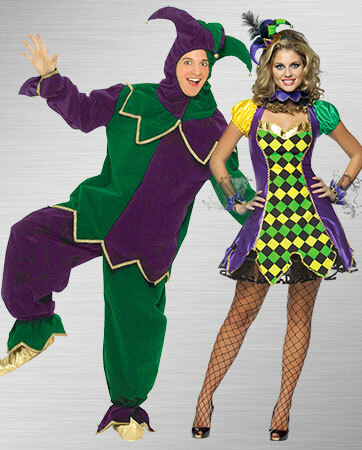 Whether you are a natural entertainer or you need a little liquid courage, these jester costumes are the perfect fit for the couple who isn’t afraid to be a fool for love. Are you more of a sultry siren or a joking jester? While they may seem to be on different ends of the spectrum, you probably have a little bit of both within you! 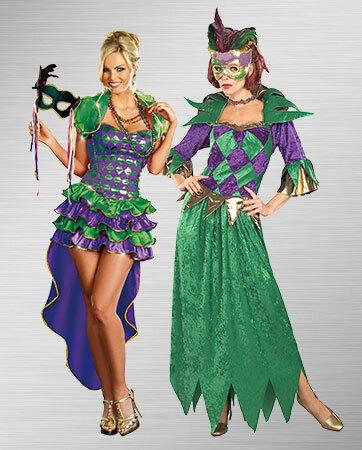 These Mardi Gras dresses let you show off your inner party diva, no matter what side of you wants to come out and play. With the traditional Fat Tuesday color scheme and a little bit of sparkle, these dresses will have you dancing the night away. You don’t have to be the king to look like royalty. Cover yourself with the soft flowing fabric of a carnival cape to make a grand entrance even more show-stopping. Keep your amazing costume a secret until you are ready for the big reveal, or cozy up in the wee hours of the morning when there is a chill in the air. Don’t ruin your costume by throwing on a jacket. Keep in the party spirit with all things Mardi Gras. From the King Cake you eat to the Hurricane you drink, you will be shrouded from head to toe in Mardi Gras spirit. When you are the center of attention you can’t spare any expense. With all eyes on you, every inch of your costume should shout “Mardi Gras,” so the boys will be shouting for your attention. From head to toe, that vibrant purple, green and gold will stand out even in the most crowded parade route. With a sultry dress, these accessories will help add that over-the-top Mardi Gras look without covering up too much skin!